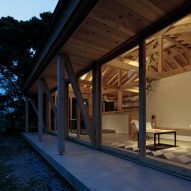 A wooden framework extending radially towards the edges of this house in Japan's Okinawa region ensures views in all directions through external walls made entirely of glass. 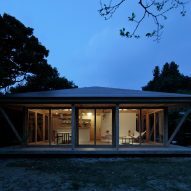 Tokyo studio ISSHO Architects designed the Shinminka house for a plot surrounded by trees and vegetation in Motobu, on the northern part of Okinawa Island. 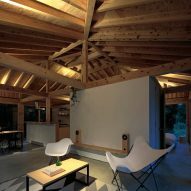 The architects sought to develop a contemporary interpretation of traditional Okinawan housing, which typically features a timber structure supporting a tiled roof that extends to create a shaded porch. "I tried not to be too nostalgic about the past, reasoned inductively, and looked through the lens of modern architecture," explained studio director Jun Vera. 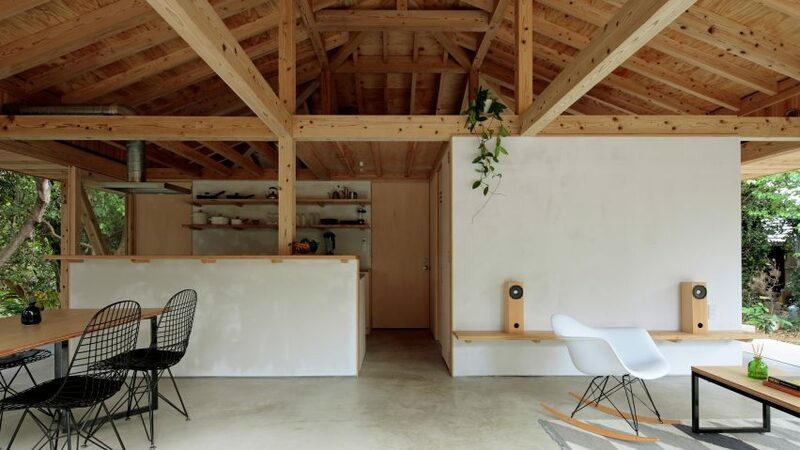 "While it might be true that, in many cases, the result ended up in line with traditional Japanese architecture, some design progress has certainly been made." Another key consideration was the island's tropical climate and the need to withstand the typhoons that occur regularly in Okinawa. 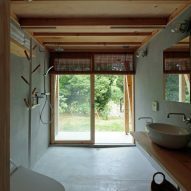 ISSHO Architects devised a new construction technique that provides the necessary strength while enabling the walls to be structurally independent. "Usually to ensure lateral strength, braces are placed parallel to the walls," said Vera. "But by designing this way ventilation and openness will be limited." "My idea was to place braces radially toward the outside, connecting to outer columns of the building." The 12 diagonal bracing beams and columns arranged around the edges of the building form a robust wooden structure capable of withstanding the wind load inflicted by a typhoon. Large eaves extend to meet the columns around the house's perimeter, providing the shade required to keep the interior spaces cool. By negating the structural requirements of the walls, these surfaces could be fully glazed and incorporate sliding sections that provide plenty of natural ventilation. The positioning of the structural beams perpendicular to the walls on every side promotes direct views of the surroundings from anywhere inside the house. The sliding walls allow the internal living areas to be opened up to the shaded porches that line the perimeter of the building. A living and dining area extends along one side of the house, with a pair of bedrooms opening onto the porch on the opposite side. At the centre is the kitchen and a closet space, with a toilet and shower room situated between the two bedrooms. 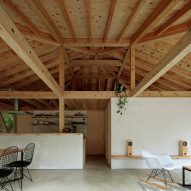 The timber framework and rafters are left exposed to emphasise the elegant construction and enhance the sense of height within the interior spaces.